You need a good cooler on a graphics card because they can get very hot when under load i.e. while playing games or running some GPU intensive applications. 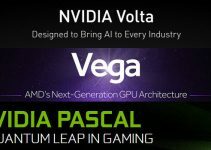 The components that heats most in a graphics card include GPU or Graphics Processing Unit, VRAM (Video Memory) and VRM or Voltage Regulator Module. All of these components need to be cooled down otherwise it can lead to instability issues, shut downs, freezing or even damage to the graphics card. There are generally two types Air coolers and fan types that you find in graphics cards, one is the blower type fan cooler and other one is open air fan cooling. 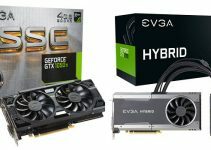 Both of these air cooling units has its own advantages and disadvantages and it may play an important role when buying a graphics card for your specific needs. Also, there is a performance difference too between blower style fan cooler and open air fan cooler which I am going to discuss more about in this post. 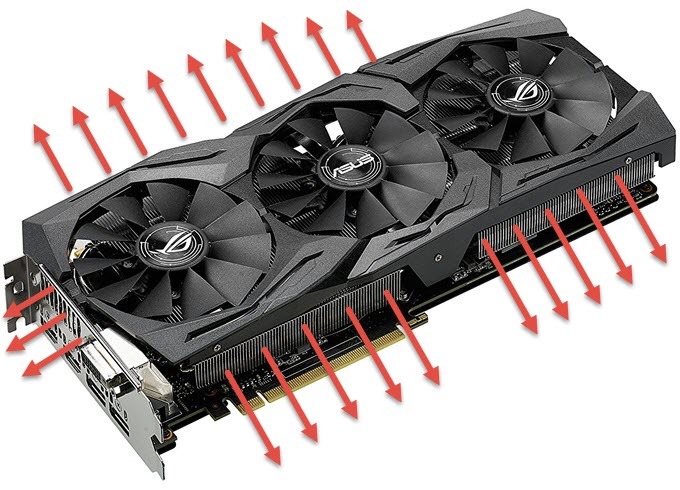 Earlier in this blog I have talked about the various of graphics card cooling solutions and you can find that article by going to the link given below. But here in this post I am going to discuss and compare blower type and open air fan type cooling in graphics cards and will tell your everything about it. So, lets get started with it. A blower type cooler comes with a blower styled fan that you commonly see in laptop CPU coolers. A blower type fan takes the air from its top and pushes the air sideways to the heatsink fins where it comes out from the rear. Hot air in a graphics card with blower type cooler comes out from the rear vents where you can find the graphics card display connectors or ports. These coolers are mainly found in the reference graphics cards from Nvidia and AMD. All Nvidia’s Founders edition graphics cards come with blower style cooler only. You may also find these blower type coolers in cheap graphics cards especially the Chinese ones. Below you can see a blower style cooler with a blower type fan at one end of the graphics card. The performance of this type of cooler is average and the fan also generates decent amount of noise and can be very noisy at higher loads. Graphics Cards with blower style coolers are also not good for overclocking because of their mediocre cooling performance. However, blower type coolers are relatively slimmer and are shorter in length compared to some of the bulky open air coolers that can consume more than two slots on your motherboard or computer case. Therefore, graphics cards with blower type cooling design are best suited for eGPU box use and for use in small form factor cases or PCs. Graphics Cards with Hybrid Cooling solution uses blower type cooler along with liquid cooler with radiator. These GPU coolers use the more traditional approach where the fan is put over the heatsink and it blows cool air on the heatsink directly on it. Most of the graphics cards uses open air coolers whether it is a budget end, mid-range or high-end graphics card. These coolers are generally bigger in size compared to blower styled cooler with graphics cards having the same GPU. The heatsink of these coolers may come with heatpipes for better dissipation and heat transfer whereas you will not find heatpipes in the heatsinks of the blower fan type coolers. 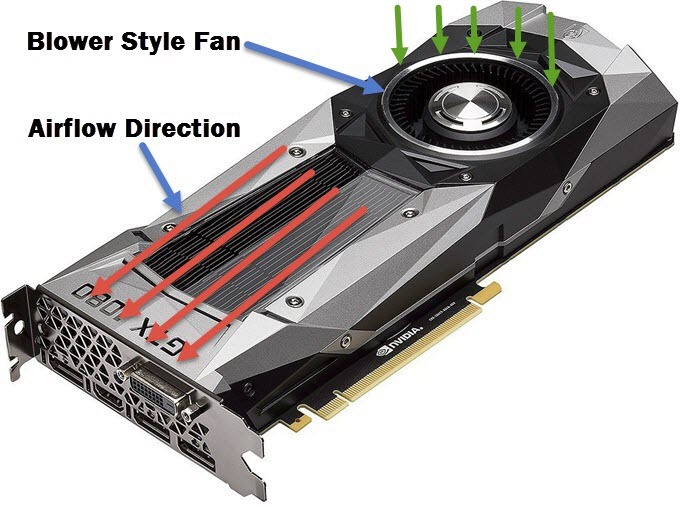 A graphics card with good open air cooler with dual or triple fans can be overclocked to higher frequencies which is not possible in blower style coolers graphics cards. All the OC Edition Graphics Cards comes with Open Air Fan Coolers having multiple fans. Below you can see an open air fan graphics card cooler with three fans and its airflow direction. A slight disadvantage of this type of cooling is that it may lead to increase in the case temperature because the most of hot air from the cooler is dispensed in the case in all directions or it gets scattered in the PC case. However, this can be overcome easily by having good airflow inside your computer case by having sufficient number of case fans. I recommend at least one intake and one exhaust fan for it. The performance of open air coolers is better than the blower type coolers and they are also relatively silent in operation. An open air cooler can have up to three fans whereas the blower type coolers have only one fan no matter how powerful the graphics card is. 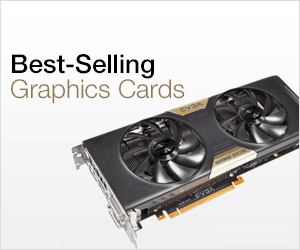 You may also find some small form factor graphics cards with open air fan cooling for use in SFF or Mini-ITX cases. Here is a brief comparison in tabular format for open air styled and blower fan styled graphics card coolers. 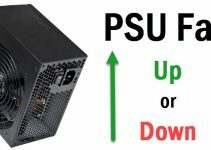 So, if you are getting a new graphics card and have big enough case then you must choose a traditional open air cooler, but if you have a small form factor case or want to use graphics card in eGPU box (external GPU case) then it is better to opt for a graphics card with blower styled cooler because of its relatively smaller and slimmer form factor. If you still have any doubts or questions regarding graphics cards or these GPU Coolers then you can ask me your queries by leaving a comment below.